After the First Crusade in 1096 AD set up Christian kingdoms all along the coast of Israel and Lebanon, of course the Fatimid caliphs who had ruled that area before were very upset. By 1144, a Mamluk general, Imad-ed-din Zangi, had managed to unite enough Turks and Arabs in his army to attack the Christian kingdoms. 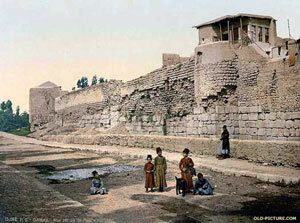 Zangi did not take Jerusalem, but he did take the Syrian city of Edessa nearby. Queen Melisende of Jerusalem sent a message to the Pope asking for help getting it back – a second Crusade. In Europe, people were very upset to learn that the Turks had taken Edessa. First, this was an Islamic defeat of Christianity. Second, it threatened the kingdom that the Normans of the First Crusade had set up, which was making them (and their European relatives) a lot of money. Who was Bernard of Clairvaux? The Pope ordered Bernard of Clairvaux (in France) to preach a second crusade to take it back and defeat Zangi. Bernard was a Benedictine abbot who had reformed the monasteries and started the Cisterician monks. He was very popular. Who went on the Second Crusade? The young king of France, Louis VII, agreed to go, along with the queen, Eleanor of Aquitaine. So did Conrad III of Germany, the Holy Roman Emperor. Louis was 23 years old and Eleanor was 22. Conrad was 51 years old, so he was kind of like their dad-chaperone. Was the Second Crusade successful? No. This time the Islamic forces succeeded in fighting off the invasion. Seljuk Turks killed most of Conrad’s soldiers as they marched through Turkey. Who were the Seljuk Turks? When Louis and Conrad reached Jerusalem, Queen Melisende (who was 39 years old, old enough to be Louis’ mother) asked them to attack Aleppo, to get a base for recovering Edessa. But Louis and Conrad decided instead to attack Melisende’s ally, Damascus. The Mamluks managed to fight off the Christian attack, and the kings and queens went home in disgust – and Melisende lost her Damascene allies. This would prove to be a model for the rest of the Crusades too: now that the Islamic armies knew what to expect, they could fight off the Crusaders as they had not in the First Crusade. Cite this page: Carr, K.E. Second Crusade – Medieval history. Quatr.us Study Guides, August 3, 2017. Web. April 26, 2019.